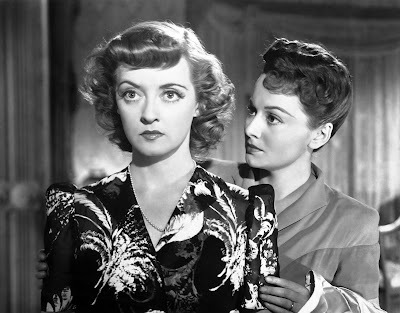 Today, I'm reviewing In This Our Life (1942), starring Bette Davis and Olivia de Havilland as battling sisters. The good folks at Warner Archive are bringing five classic Bette Davis movies back into print. Each Friday in September, I'll have a review of one of these movies (here's last week's review of The Man Who Came to Dinner). 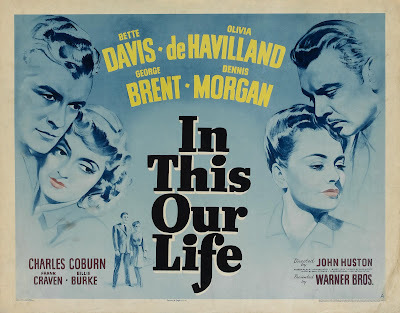 Today's selection is the melodrama, In This Our Life (1942). The Director: John Huston and Raoul Walsh. The Stars: Bette Davis; Olivia de Havilland; George Brent; Dennis Morgan; Charles Coburn; Ernest Anderson; Frank Craven, and Billie Burke. Source Material: The 1941 Pulitzer Prize winning novel by Ellen Glasgow. Plot: Sisters Stanley (Davis) and Roy Timberlake (de Havilland) are the daughters of a once prosperous tobacco-selling family in Richmond, Va. While the dutiful Roy marries a doctor (Dennis Morgan) and tries to help her weary father (Frank Craven) and invalid mother (Billie Burke), the party loving Stanley spends money with abandon, drives her car too fast, and jilts her lawyer fiance (George Brent) to run off with Roy's husband. Backstory: Warner Bros. paid $4,000 for the rights to Glasgow's novel and then gave the production to director John Huston who had just scored a major triumph with his film debut, The Maltese Falcon (1941). However, when Huston was called up to serve in World War II, director Raoul Walsh took over the production. 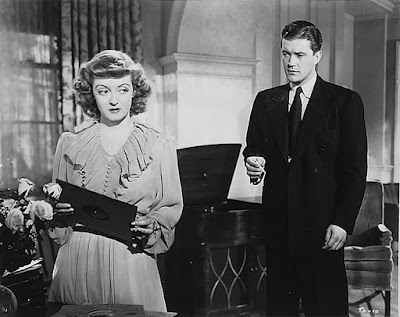 Bette Davis and Dennis Morgan in a production still for In This Our Life (1942). Why Bette's Great in The Man Who Came to Dinner: Bette always hated In This Our Life -- she wanted to play the "good" sister, Roy, instead of Stanley -- and she endlessly battled with Huston over everything from the script to her hair and makeup. Despite all that strife, Bette gives a great performance. She plays Stanley as an immature spoiled brat who always gets her what she wants, even when she is framing someone else for manslaughter. Best Performance Other Than Bette: Ernest Anderson, who gives a sensitive, dignified performance as a young African-American man who is falsely accused of murder. Honorable mention goes to de Havilland who brings depth and complexity to another of her many good girl roles, and Charles Coburn as a rich uncle who is abnormally obsessed with Stanley. Bette Davis knitting on the set of In This Our Life (1942). Best scene: The final car chase scene, which features exceptional camera work from cinematographer Ernest Haller. Best Line: "Why don't you admit the truth, Craig? You've never gotten over me and you never will." -- Stanley to her former fiance. Fun Fact: President Barack Obama's mother, Stanley Ann Dunham, was named after Bette's character in this film. Dunham's mother thought the character's male name was sophisticated, and Stanley was also the first name of Dunham's husband. The Critics: In This Our Life has an 73 percent fresh audience rating on Rotten Tomatoes and Leonard Maltin writes that "Davis [is] at histronic height" in a three star review for his Classic Movie Guide. 1. Race relations. In This Our Life was one of the few old Hollywood films that dealt honestly with race in forties America. The movie shows that there was very little that African Americans could do when they were falsely accused of a crime, especially when it was their word against that of a white person. This is emphasized in a powerful scene where Anderson keeps repeating, "it won't make a bit of difference" when Brent's character urges him to tell the truth. 2. Coburn. One of old Hollywood's great character actors, Coburn is outstanding as a rich uncle who has a somewhat incestuous interest in Stanley. 3. 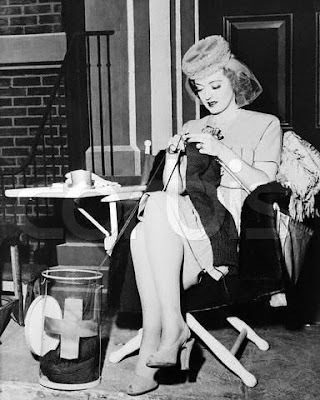 Bette's look. Davis fought endlessly with Huston to get the look she wanted for Stanley, and her instincts, as usual, are spot on. Bette gives Stanley a gaudy taste in clothes and overly made up look that is perfection for a woman who is only concerned with material things. 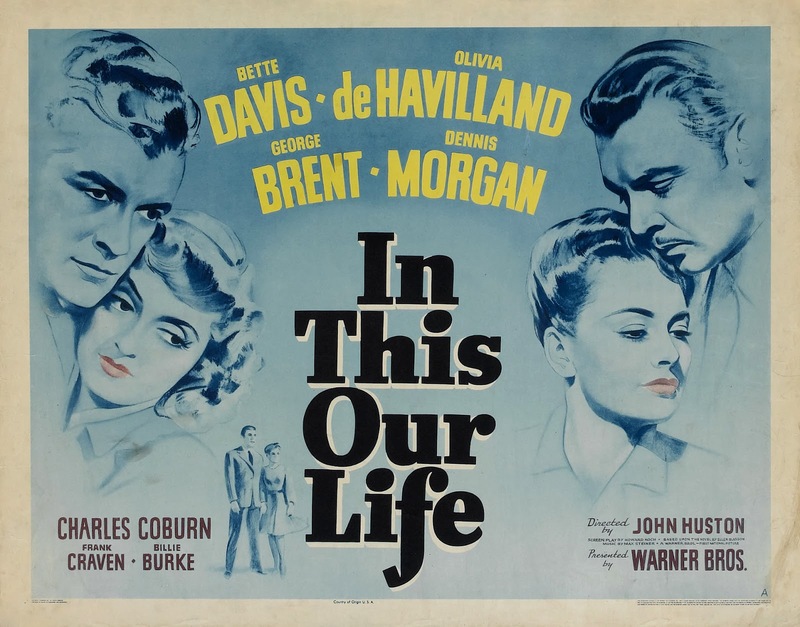 Availability: In This Our Life is available on DVD from Warner Archive (link below). It is also available on video on demand. DVD Extras: Commentary by film historian Jeanine Basinger and a Warner's Night at the Movies package that includes the trailer for the Errol Flynn-Ronald Reagan World War II drama Desperate Journey (1942); vintage newsreel of Hollywood stars visiting Washington D.C. to support the war effort (you'll see lots of stars including Desi Arnaz, Cary Grant, and Claudette Colbert, but the highlight is Oliver Hardy squeezing himself behind a jeep); the Technicolor short March On, America!, which was designed to boost wartime morale; Ballet stars Leonide Massine and Tamara Toumanova join the Ballet Russe de Monte Carlo for the musical short Spanish Fiesta, and Porky Pig talks to the animals in the Looney Tunes cartoon, Who's Who in the Zoo.